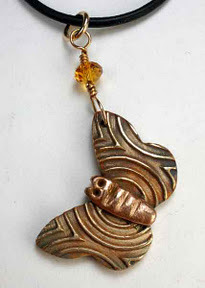 Here’s another butterfly from my recent little extravaganza making bronze pieces alluding to pollinators. I had this one out at the recent open house at Zelda’s, and got into a discussion with another artist (Jan) and a couple other customers from the store. 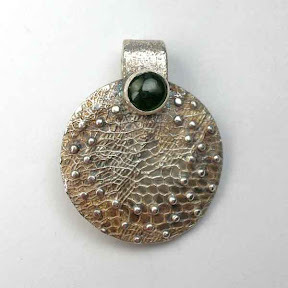 Jan had taken one of my butterfly workshops where she made several gorgeous silver pieces. I’d tumble-polished them to an even, high shine for her, per her request. And she had them on display, for sale, at Zelda’s. At least one of the customers indicated her opinion that I should have polished my bronze ones as much. While I did polish the butterfly in this photo a bit, I chose to not take it to that same high level of shine. Why? Mostly because I liked the hints of color hiding down in its hollows. (Same thing with the butterfly shown in my last post.) To me, those subtle hints of color are part of the appeal of the bronze. To you of course, it may just look like it still needs to be polished some more. If that’s what you want on a piece you’re thinking of buying from me, please just ask! Once I’ve polished it, however, all of it will have that dark-golden yellow tone that bronze takes on. All of the other tints will be gone. I have done that for all sorts of pieces, but it’s just not high on my list of surface treatments for butterflies. I guess I imagine my Lepidoptera, to appear colorful. That discussion did prompt an idea for me, for a project for next year: to make a series of pieces that are, not identical, but similar, and finish them in a series of ways. One like these butterflies, another with a solid-color satin finish, and another that is as shiny as I can get it. Don’t hold your breath waiting for the results to appear here, but know it’s on the to-do list at least. If you have done anything similar, please let me know, and we can compare notes! In the meantime, I’ll close with images (regular readers of this blog may have already seen them) of two silver pieces I’ve made that are much shinier (though I’m not sure how fully that appears in the photos). 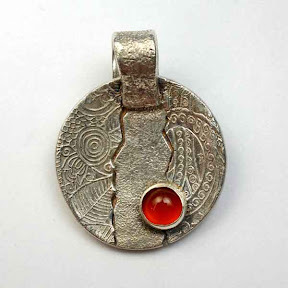 The pendant has had a bit of patina added down in the lines of its pattern; the ring has some color in the ruby stone that’s set on the top. 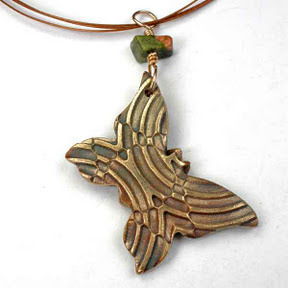 Unlike last year, when I wrote about my appreciation for working with silver metal clay in the sense that one could design, build, fire, and polish up a little butterfly pendant fairly quickly, this year I found myself playing with bronze and copper for my own little one-of-a-kind pollinator-extravaganza. Because of added time involved in each of several steps with the bronze and copper clays — mixing, firing, and polishing — those pieces require planning ahead if one is to complete them prior to a specific deadline. This little critter has a copper “body” on the other side, but I’m displaying this one to show the shading that remained after some polishing. I thought that the little green and orange unakite bead complemented that nicely, so that’s what I attached to its little bronze hanging wire. Be Happy: This Saturday @ Zelda’s! 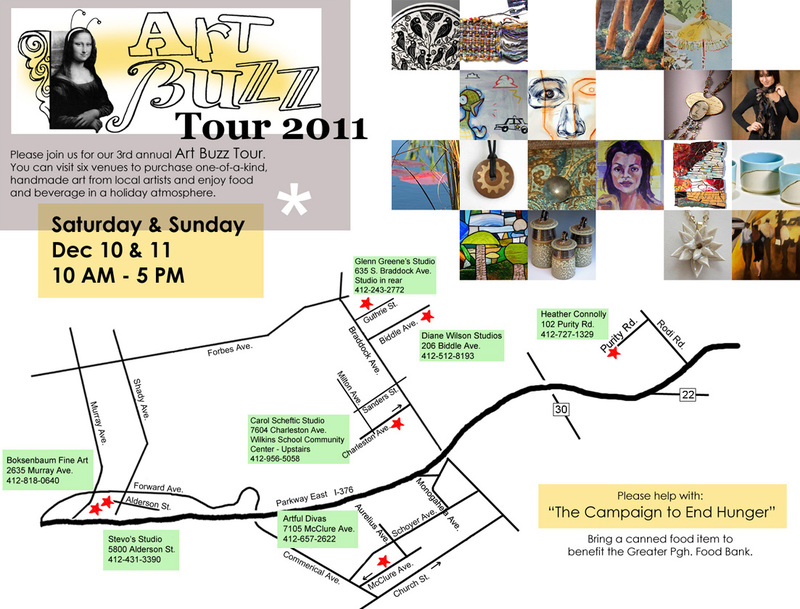 This Saturday, December 17, if you find yourself anywhere around the corners where Pennsylvania, Ohio, and West Virginia meet up (near where the Allegheny, Monongahela, and Ohio Rivers connect), you really should head on over to Zelda’s Bead Kit Company in Bridgeville, PA.
And Saturday should be great because there will be even more folks there that day: a whole collection of friends and workshop teachers have been invited over for a special “Holiday Open House and Christmas Party” that will also serve as a showcase of local talent. We’ll have finished pieces for sale, and be happy to talk with you about workshops we plan to offer, or others you might like us to add to the schedule, for projects you’d like to undertake yourself. This post ends with photos of just a few of the samples I made for workshops I’ve led at Zelda’s in the past year; samples for 2012 are in the design stage and will start to appear soon after the start of the new year. And some Holiday-colors now too. Today’s “colorful” story starts with the fact that I’ve had a disk with a sort of “dotted web” design sitting around for quite some time now. As in, for several years. In the dried-clay state, just a disk, pattern on one side but nothing on the other yet, no bail, etc. I made it quickly at the end of a “clay play day” with other members of my local Metal Clay guild. One of those moments when, rather than pack up the rest of my opened but unused clay with no idea when I’d have a chance to get back to it, I just made something, thinking I’d figure it out later on. I will often finish off a pack that way except, usually, it doesn’t take quite so long until I complete a piece started under those circumstances. With the price that silver got up to this past year, last spring I decided I needed to get more of my UFOs (Un-Finished Objects — especially the silver ones) into a finished state and off to new homes. (Thus earning enough money to buy more silver, of course!) This being me, however, I had to at least try to make it reversible. So I cut out three deckle-edge strips and added them, mosaic-style, to the other side. (Yep, I cut three different pieces of textured clay using crafting scissors with a deckle edge pattern.) And I added a bail. But it still didn’t feel “finished” to me yet, so I set it aside for another four months, completing a good number of others in the meantime…. After maybe two months more, I finally gave in to what it was asking for: each side got its own gem! The decision to put a jade piece on the “web” side was easy. I kept debating over the other side and then I remembered that I had some citrines that were on the red end of the orange range. If I used one of those, I could make a reddish-and-green piece that might jump out as a great gift for someone during the Holiday season, but would still be versatile enough to wear year-round. The end result, at last, is shown here. Several posts ago, I mentioned that I was thinking of polishing this piece up, more than anything to see just what color the “rose bronze” would turn out to be. As a quick reminder: that’s the only metal I used in the construction of this bead. The other reason, of course, is that any such patina-color (whether produced by heat, chemicals, or any other method) is still somewhat ephemeral. Since I’d been undecided about polishing it, I hadn’t applied any sort of coating in an attempt to hold the coloring a while longer, and the colors on this rose bronze had darkened noticeably after only a very few weeks, until it was much darker than shown here. So I had a go at it with some of my favorite little 3M radial bristle disks. I think it shined up nicely! I should probably also note that one advantage of a nicely polished surface is the way that finish is relatively easy for anyone to maintain over time. And, I admit, I didn’t go “all the way” with that polishing here either, because I was hoping to keep just a hint of the rainbow-colors that the kiln-firing had produced. And, so far at least, that hint is still there; along the edge of the folds of the layered side, and along the left edge of the side with the coils. Hooray! Time to send it off to a holiday show, and hope it can find a happy new home with someone who will take delight in wearing it.